Edward Snowden: "Expiration of Portions of the Patriot Act = Historic Victory for the Rights of Every Citizen"
Ending the mass surveillance of private phone calls under the Patriot Act is a historic victory for the rights of every citizen, but it is only the latest product of a change in global awareness. Since 2013, institutions across Europe have ruled similar laws and operations illegal and imposed new restrictions on future activities. The United Nations declared mass surveillance an unambiguous violation of human rights. In Latin America, the efforts of citizens in Brazil led to the Marco Civil, an Internet Bill of Rights. Recognizing the critical role of informed citizens in correcting the excesses of government, the Council of Europe called for new laws to protect whistle-blowers." "The Freedom Act explicitly reauthorizes — or, rather, reinstates, since they technically expired at midnight May 31 — other programs involving the collection of business records that the Bush and Obama administrations claimed were authorized by Section 215 of the Patriot Act. In fact, even the bulk collection of phone records, which was abruptly wound down last week in anticipation of a possible expiration, may wind up again, because the Freedom Act allows it to continue for a six-month transition period. And while the Freedom Act contains a few other modest reform provisions‚ such as more disclosure and a public advocate for the secretive Foreign Intelligence Surveillance Court, it does absolutely nothing to restrain the vast majority of the intrusive surveillance revealed by Snowden. It leaves untouched formerly secret programs the NSA says are authorized under section 702 of the FISA Amendments Act, and that, while ostensibly targeted at foreigners, nonetheless collect vast amounts of American communications. It won’t in any way limit the agency’s mass surveillance of non-American communications." What was the "Giant Leap for Congress" to which Froomkin alludes? "This marks the end of a vast expansion in surveillance authorities that began almost immediately after the 9/11 terror attacks. 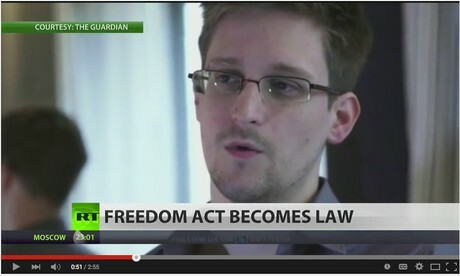 Indeed, the Freedom Act represents the single greatest surveillance reform package since the 1970s. But that’s a low bar. After 14 years of rubber-stamping executive-branch requests for pretty much anything related to terrorism, Congress had an extraordinary moment of opportunity to pass genuine reform." "By permitting one section of the Patriot Act to expire and by replacing it with the USA Freedom Act, the federal government is taking credit for taming beasts of its own creation. In order to operate its computers at these facilities, the NSA placed its own computer analysts physically at those computers 24/7. It then went to the U.S. Foreign Intelligence Surveillance Act (FISA) Court and asked for search warrants directing the telecoms and Internet service providers to make available to it all the identifying metadata — the times, locations, durations, email addresses and telephone numbers used — for all callers and email users in a given ZIP code or area code or on a customer list." "The first document revealed by Edward Snowden two years ago was a FISA court search warrant directed to Verizon ordering it to make available to NSA agents the metadata of all its customers — more than 113 million at the time. Once the court granted that search warrant and others like it, the NSA computers simply downloaded all that metadata and the digital recordings of content. Because the FISA court renewed every order it issued, this arrangement became permanent. "When politicians tell you that the NSA needs a court order in order to listen to your phone calls or read your emails, they are talking about a FISA court order that is based on government need — not a constitutional court order, which can only be based on probable cause. This is an insidious and unconstitutional bait and switch." What Can we Do to REALLY End Surveillance? We need to remain vigilant against the surveillance state and to work on new laws that will protect our privacy. "[CISA] says that any and all privacy laws, including laws requiring a warrant for electronic communications, and those that protect financial, health or even video rental records, do not apply when companies share “cybersecurity” information, broadly defined, with the government. For much more detail, please see this blog and coalition letter and a deep dive by the Open Technology Institute. Once that information is shared, it will be automatically disseminated government-wide, including to outfits like the National Security Agency, CIA, and FBI, where it can be used for garden-variety law enforcement investigations and intelligence activities. It can also be used to investigate and prosecute whistleblowers under the Espionage Act, the World War I-era law that has been used by the Obama administration to go after more national security “leakers” than all other presidencies combined. In short, it makes mincemeat of basic notions of due process. But that’s not all. This isn’t just a problem in the abstract for 'privacy.' It would actually make things less secure." Hang On, Isn't This the Same Government whose Info Gets Routinely Hacked? The ACLU's Gabe Rottman points out the irony in the fact that the US Government's personnel systems were hacked last week, and personal information of all non-military Federal employees (including their social security numbers) were stolen. "If the federal government can’t secure the most sensitive intelligence and military data against spies and cyber-thieves, what does that mean for the vast amount of personal information that would flow to the government from the private sector under CISA? The answer is obvious. The honeypot would grow all that much sweeter. Not only would you have a one-stop shop for government worker information, you would have a new trove of personal information about all of us, held in what have proved to be tempting and vulnerable targets for the baddest of actors." As customers/citizens, we need to remain vigilant in order to protect our rights against unlawful search and seizure. It's one thing to voluntarily post family pictures on Facebook, explicitly trading anonymity for social connections. It's another thing entirely to have government agencies and criminal hackers intercepting your private communications on the phone and via email and your business, financial, health, and other personal records. That's not the society any of us wants to live in! Scott Jordan	on June 13, 2015 at 11:19 a.m. Unfortunately it almost doesn't matter what Congress does to rein in mass surveillance within our borders. Agencies in other countries have long been happy to do what US law hinders. This has been the case for a long while, for example with Echelon in the 1990s after it morphed from surveilling Soviet sigint to surveilling ...everyone. More than two long years after Snowden's whistleblowing, this week's legislative activity in Washington finally represents a start. But not a finish. Liberty necessitates persistence and vigilance, and lost liberty is difficult to regain. So let's keep up the fight!